The European Parliament’s chief Brexit negotiator will meet Northern Ireland’s political leaders later at the start of a two day fact-finding mission. Guy Verhofstadt will also visit communities on the Irish border that harbour concerns about the impact of the UK’s exit from Europe. Former Belgian prime minister Mr Verhofstadt will then travel to Dublin, where he will meet Taoiseach Leo Varadkar on Thursday and also address a special joint sitting of a number of Irish parliamentary committees. The MEP’s visit comes ahead of next month’s crucial summit in Brussels when leaders of the EU 27 will decide whether sufficient progress has been made in the first phase of negotiations to progress talks to focus on future trading relations. The EU has insisted progress has to be made in three key areas - citizens’ rights, the size of the UK’s exit bill, and the shape of the Irish border post Brexit. The parliament’s Brexit co-ordinator will start his day in Belfast with a private meeting with academics from Queen’s University who specialise in history and politics. He will then travel to Parliament Buildings, Stormont, where he will be greeted by the speaker of the crisis-hit assembly, Robin Newton, before holding meetings with political leaders. 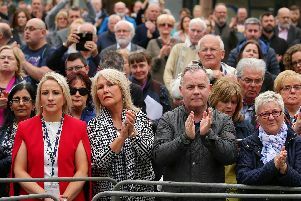 Democratic Unionist leader Arlene Foster and Sinn Fein’s Stormont leader Michelle O’Neill will hold individual meetings with Mr Verhofstadt, as will Ulster Unionist leader Robin Swann, SDLP leader Colum Eastwood and Alliance deputy leader Stephen Farry. After leaving Belfast, he will visit a farm that straddles the Irish border. Mr Verhofstadt will then meet campaigners opposed to a hard Brexit and representatives from the road hauliers industry. He will hold talks with Mr Varadkar on Thursday morning before addressing a joint sitting of a number of Dail committees.